Applied ground support towers range from 12” x 12” Tower Truss all the way up to 20.5” Heavy Duty Truss. No matter what type and how much gear you need to fly for your production or live event, you will find the correct ground support tower from Applied. Give us a call and we will work with you to put together the correct ground support system for your lighting, sound, video or truss flying needs. The LA12-25 line array tower is constructed with 12” Tower Truss and is certified by structural engineers. With a maximum weight limit of 1500 lbs, when the tower base is properly ballasted, you can fly your sound line array or video wall with confidence. The LA12-25 comes with the option of a subwoofer deck. Use ballast per engineering data, ballasts are not provided. 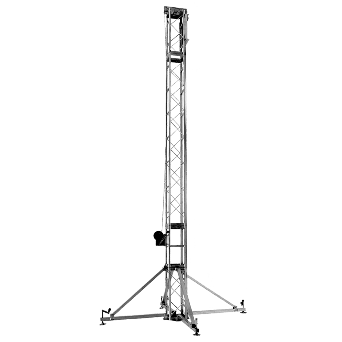 The LA16-30/LA16-35 line array towers are constructed with 16” Tower Truss, with a maximum height of 35’ and are certified by structural engineers. When the tower base is properly ballasted, these towers have a maximum weight load of 2200 lbs. The LA16-30/LA16-35 both come with the option of a subwoofer deck. Use ballast per engineering data, ballasts are not provided. Applied manufactures Tower Truss sections in 12”, 16” and 20.5”. With their maximum heights being 30’, 45’ and 60’ respectively, the Tower Truss can be used indoors or outdoors. The use of guy wires are required for outdoor use. Applied GS Towers are constructed from heavy duty, schedule 80 aluminum tube and are designed to be used as column. The GS Towers are available in 12”, 16” and 20.5” box tower truss. These towers are fabricated by our certified welders, and are available with bolted or spigoted connections. The light duty GS Winch Tower base is equipped with a heavy-duty hand winch and utilizes our standard 12″ Tower Truss and offset head block combined with a four-sided sleeve block drilled for 12″ x 18″ Heavy Duty Box Truss. The perfect solutions for flying a video wall. The Applied L-25 Mini Tower is a hinged truss tower that provides support for small roof systems or lighting grids. It features a modular design for quick assembly and easy loading. The Mini Tower comes standard with a heavy-duty hand winch; however, a CM chain motor package is an available option. Applied offers four standard Goal Post Systems that are customized based on your LED or video wall size, weight and location. These systems can be outfitted with either hand winches or chain motors. Applied Goal Post Systems can be used indoors or outdoors, if using outdoors guy wires are required. Use ballast per engineering data, ballast are not provided. The Tower Lifting Ladder is available for 12”, 16” and 20.5” towers and is designed to raise and lower GS Towers safely using a one-ton chain motor. The chain motor and accessories are not included with the ladder.